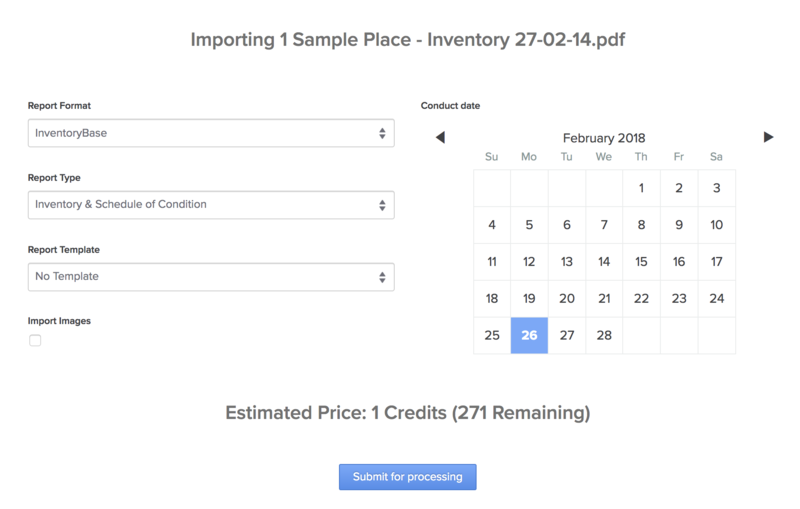 If you're going to visit a property to conduct a Check In or Check Out from someone else's inventory report, or you're new to InventoryBase and want to get your last report into InventoryBase quickly before the next visit, you can use our PDF Import service. Add the Property to InventoryBase via the Properties tab. Click Choose File to select the PDF you want to import. Once a PDF is chosen, we'll automatically count the pages in the PDF and show you the estimated price at the bottom of the page. You can change the required Turnaround Time between 3 day (low priority), 24 hours and same day (6-12 hours). Same day turnaround times are more expensive. If you have any specific notes for what to ignore or anything specific about this report that we need to know, type that in the Notes box, choose what type of Inspection it is and on the right hand side choose the date you originally produced the report so the report is correctly backdated. Once you click Submit for Processing your report will be uploaded to our time and returned to you within the chosen turnaround time, fully written up into the InventoryBase report editor and ready to review and complete for your next report.